Exclusive Italian marble tile with a seacray fish design in the center of our wine cork board. Tumbled Italian Botticino Marble Tile (4"x4") centerpiece of our famous Sea Life Cork Bulletin Board collection. (Craft Kit) Pop those wine corks...and create wine cork boards, trivets and message centers that capture both memos and memories. Our wine cork products are one of our most popular, since half the fun is in the making! Your special occasion corks will no longer have to collect dust or hide in a drawer. With our unique variety of cork boards you can create your own personal work of art. 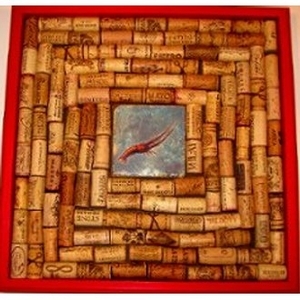 Use white or hot glue to attach wine corks to artwork. Directions included. Hint: sand down corks for perfect fit! The solid pine frame, mounting board and tile included. Measures 16"x16". Corks not included. Finish: Painted Color Cherry Red Due to the unique nature of materials used in our designs, every piece will reflect its own personality. Variations can occur in color, texture, grain and final finished appearance.